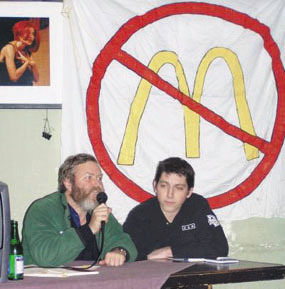 Food Not Bombs co-founder Keith McHenry has given presentations at many venues since he started to tour in 1994. These are just some of the colleges, conferences and other venues where Keith has spoken. Before touring for Food Not Bombs Keith was a National Park Ranger giving presentations at Boston Historic Park for two years at sites including Faneuil Hall, Bunker Hill Monument, Old South Meeting House and the Boston Navel Ship Yard. 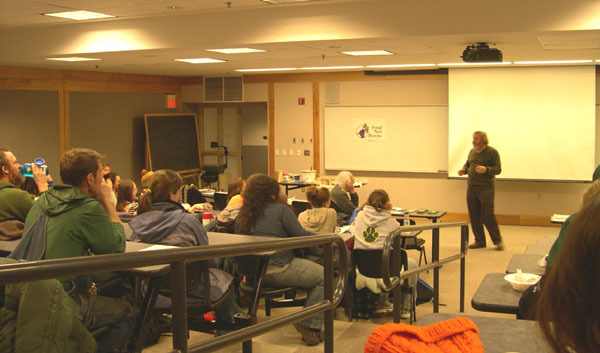 Keith took two professional public speaking courses provided by the National Park Service. COLLEGES: The University of Calabar Nigeria; Universidad Nacional Autonoma de Mexico and Universidad Autonoma de Nuevo Leon; Dartmouth College; Hampshire College; MIT; Northwestern; Anderson University; Knox College; Universidad Católica Santa Teresa de Jesús de Ávila; The University of Milan; The University of Washington; Oberlin College; University of Vermont; The University of Oregon; Harvard University School of Law; Illinois Wesleyan; Reed College; Lewis and Clark; Virginia Tech; UMBC in Catonsville; Appalachian State University; Peace College; University of Florida in Tampa; University of New Mexico; University of Nebraska Omaha; Ursinus College; St. Ambrose University; Goucher College; University of Wageningen; SUNY Purchase; Swarthmore College; Vanderbilt University; Hendrix College; Marist College; Vassar College; SUNY Albany; SUNY Buffalo; Marlboro College; Vermont Law; Brandeis University; Northeastern University; Boston University; Truman College; University of York; Universit ät Tübingen; San Francisco State; The University of San Francisco; Sonoma State University; Skidmore College; Beloit College; Principia College; University of Colorado, Boulder; Bates College; Guilford College; University of Massachusetts; Amherst; Wesleyan University; Ohio Wesleyan University; Illinois Wesleyan University; New College of Florida; University of Wisconsin Madison; Linn-Benton Community College; Santa Clara University; University of Missouri; University of Hawaii; University of Victoria; University of Massachusetts Dartmouth; Warren Wilson College; University of Puget Sound; The George Washington University; Carleton University; Hampshire College; Gonzaga Law School; Saint Mary's University of Minnesota, ; Millersville University of Pennsylvania; University of Michigan Ann Arbor; Brock University; Pitzer College; University of Mary Washington; Ferris State; San Diego City College; Green Mountain College; Moorestown Friends School; Williams College; Princeton University; Earlham College; The University of Cincinnati; M.I.T; Kitchener Ontario School of Public Interest; University of Texas at Arlington; University of Northern Arizona; and the World College. 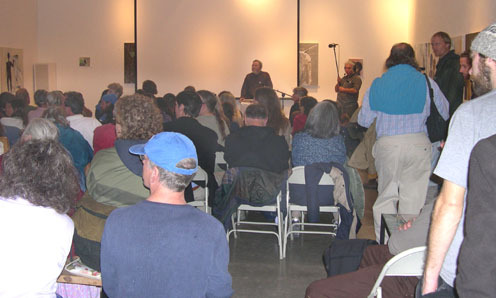 CONFERENCES: The San Francisco Anarchist Book Fair; The Sustainable Peace Fair; Law and Disorder at Portland State; Festival Mundial de la Digna Rabia in Mexico City; The Building a New World Conference in Radford; Virginia; the Rawspirit festival in Sedona and Prescott; Arizona; Amnesty International Albuquerque Open House; The Victoria Anarchist Book Fair; The Asia Pacific People for Environment and Community Conference; New Mexico Bioneers Conference; Hunger Awareness Week The William Jewett Tucker Foundation at Dartmouth College; Hunger Awareness Week at American University; The AR 2010; 2011 AND 2012 National Animal Rights Conference: F.L.A.R.E. in the Void Convergence, Australia; Beyond Borders: Education; Immigration and Cultural Exchange with the New Mexico High School Youth Conference; Hunger Banquet - Student PIRG's national Hunger Clean Up at Oberlin College; Conference Organizer for the National Student Campaign Against Hunger and Homelessness; The Green Festival San Francisco; Fourth Annual North American Anarchist Studies Network Conference New Orleans; Northeastern University Food Justice Week Keynote Speaker; The Big Food Fight - Main Hall of the University of Northampton; National Peace Conference in The United States; Albany; New York; Open the Cages Conference 2010 Washington DC; NYC Anarchist Film Festival; The Black and Green Forum at the University of the Philippines; Manila; Oxfam Chicago Loyola Hunger Banquet; Peace News Gathering - Nottingham; The Farm Sanctuary Vegan Thanksgiving; Social Center Torchiera; Milan; Italy; Source Festival Maui, Camp Keanae, North Shore Maui; The Michigan Human Rights Conference; Creating a Compassionate Community to End Homelessness Central Connecticut State University; All Power to the Imagination Conference in Sarasota; Florida; Minneapolis - Animal Rights Coalition; The founding convention of the Ethiopian Vegan Association in Addis Ababa; The 5th Annual UNM Peace Fair; and the Parliament of New South Wales in Sidney, Australia.